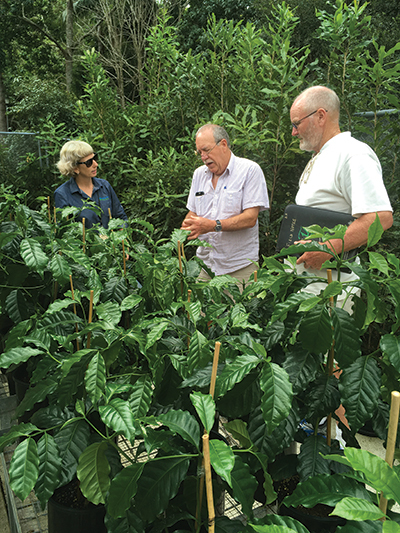 In January 2017, 72 cultured seedlings of three different coffee varieties arrived from Florida at Southern Cross University (SCU) in Lismore, New South Wales, in sterile tubes. 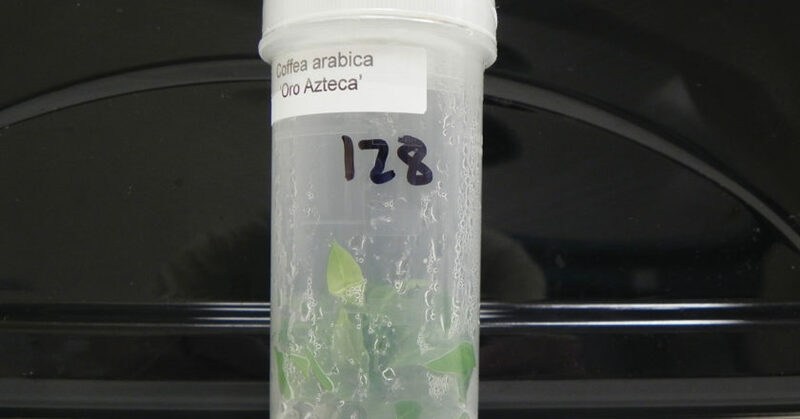 The carefully facilitated seedling transfer was part of World Coffee Research’s (WCR) International Multi-location Variety Trial, an effort to facilitate the global exchange of the world’s best coffee varieties. WCR gathered 35 top-performing coffee varieties from 11 suppliers around the world and had them replicated in sterile culture by a Florida propagator, The varieties, with about 50,000 plantlets, were distributed to 23 coffee growing countries for planting on more than 60 test plots. One of those countries was Australia. Agrifutures Australia in association with SCU recognised that research into coffee plant diversification would play a vital role in keeping the Australian industry cost competitive, reduce labour costs and production loss due to oversized trees, find disease-resistant cultivars, and help stimulate new growers to the industry. Three cultivars have been successfully brought in through quarantine in the first test batch, with a further nine about to be released. This represents 438 trees to date, about half of the total that will be transferred to a field trial located on NSW Department of Primary Industries (DPI) land in Alstonville. The field trial in the Northern Rivers region of New South Wales will involve growing up to 30 plants of each cultivar. It is important that we are able to disentangle any variation observed due to the cultivar itself from variation that may be due to the immediate localised growing environment. The WCR experimental design requires SCU to arrange cultivars in rows of 10 so that they are randomised with respect to surrounding cultivars. The result is three sub-plots in what is termed a “randomised block design”, which allows researchers to conduct sophisticated statistical analysis within the trial and in comparison with other established WCR world varietal trials. A major batch of 21 cultivars is due to arrive in early May. Apart from some minor logistical hiccups in transporting the plantlets from Florida to Lismore, the new plants transferred to date all look healthy, reasonably uniform, and are settling into the sub-tropical environment. The local industry already has its eye on one of the varieties, which has appropriate habit and carries some resistances. At the moment, we have provided feedback to the WCR consortium on improving ways to transport the plantlets under sterile conditions to meet Australian biosecurity standards. There’s no underestimating the enormity of this project. Transferring in vitro material (see image left) under sterile conditions to meet Australian Biosecurity standards has been an interesting challenge. When the sterile plants reached our quarantine lab in Lismore, we carefully transferred them to a sterilised growing medium in the SCU quarantine greenhouse and weaned the plantlets from their protected microenvironment to establish robust growing seedlings. The first stage is several months under a mister system (see below). As they grow larger, the plants are transferred to large pots. During the six months they are in quarantine, a Biosecurity-approved plant pathologist carries out regular inspections. Prior to release, the Department of Agriculture and Water Resources needs to assess the complete set of inspection reports and then issue a formal release document for the specific batch of plants. More generally, securing funding is an ongoing and major concern for this important strategic effort. The next stage in this project is establishing the replicated trials on the NSW DPI land and collecting data about tree growth, flowering patterns, and cupping quality. This will take at least three to five years. In the meantime, we hope to establish some secondary trials of promising cultivars and vegetatively propagate them from specific founder trees in the trial. This propagation, most likely via cuttings, will generate genetically identical clones of a mother plant. Ideally, the industry would benefit from commercial partner(s) to establish any introduced cultivars. There is a tremendous opportunity to build on Australia’s pest-and disease-free production status. Australia has a well-developed and highly regarded research and development and biosecurity infrastructure. We hope that through this trial, we can help contribute to the improvement of global coffee production in terms of quality and production efficiency and further stimulate the Australian coffee growing industry. By Professor Graham King, Director of Southern Cross Plant Science, Southern Cross University.